Because Ubuntu’s PostgreSQL does not seem to be usable, I decided to switch to MySQL^H^H^H^H^HMariaDB and by chance I stumbled across this article that mentioned My is actually the designer’s daughter and so is Maria. Since I found out some time ago that Mimi is the same name as Maria and My sounds suspiciously similar to Mimi, I wondered right away if My is also a diminutive of Maria. Wikipedia mentions that Michael Widenius lives in Finland, so at first I looked for Finnish names; then I realized that Widenius is obviously a Swedish last name so I looked for Swedish names instead, and found that My is indeed a diminutive of Maria. So I wondered: MySQL’s “My” and MariaDB’s “Maria” are, as I suspected, the same name. I wonder if they’re actually the same person. Wikipedia suggests they aren’t, but the entire “Personal life” section has been tagged as missing citations (ok, maybe I’ll agree with their citation policy this one time), so it’s still possible they are actually the same daughter. How do you feel to have something you didn’t write attributed to you? Not my article, but I’m still deeply disturbed because librarians and open-source advocates share the same ideals (and I was an OLA member at one point). The whole dubious deal is chronicled on Stewart Varner’s blog. I have had the experience of having my writing rephrased so that it didn’t read like my own, and having all communication cease right after I turned in an article. I thought that was bad; what the American Library Association has done is infinitely worse. I dropped by BMV today by chance. As I walked in I thought, “So where should I go to?” Then I instinctively walked to the “Languages” section. It looked exactly like the APA manual, but it’s a different colour, and it says “Presenting Your Findings” on the spine. 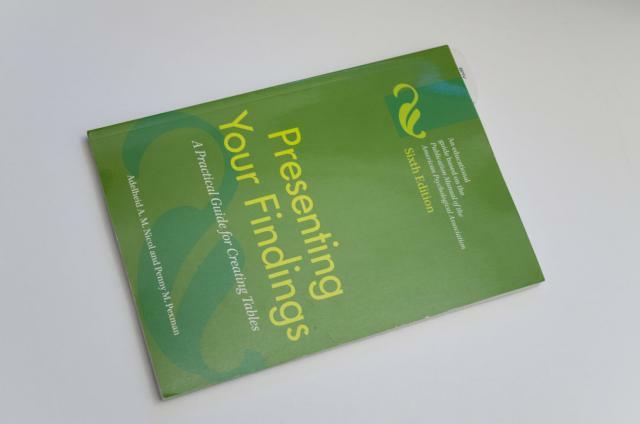 I took it out and there it says, “Presenting Your Findings: A Practical Guide for Creating Tables,” published by the American Psychological Association. I scanned the shelves another time to see if the other one for figures was there somewhere. Nope. I scanned it another time to make sure. Nope, not there. Still, just this one was a very unexpected find. Who would have thought, BMV? I literally had never seen this book before, anywhere: not even at Chapters or at the U of T Bookstore. Since my Pentax is half dead, I have been using my old Canon. But when I tried taking some pictures today I found I couldn’t turn it on. I thought the battery was dead. But when I went home and plugged it into the charger the “charging” light didn’t flash. Zilch. Since I had to charge some other batteries I unplugged the Canon charger, plugged in the NiMH charger, and the NiMH charger just ran fine. So I have no idea what happened to my Canon. Anything could have gone wrong: Fried charger, broken cable, dead battery, or — heaven forbid — fried motherboard. Maybe it’s just too old and decided to refuse doing any more work. So I now have no working camera and can’t document any more work. A half dead Pentax is still better than a completely dead Canon, I guess. Sigh. So yesterday (Friday) after the meeting I was thinking of just buying two Vietnamese subs for lunch and started wandering in the general direction of Spadina. And then it dawned on me that since I was already on College I might as well find a computer store and see if people actually still sell CF card readers (since I was told people actually still sell these things). So I got my CF card reader (yay for stop-gap measures until I can figure out what to do with my broken SLR) and went to Gwartzman’s to take a second look. And I found that — contrary to what store staff told me the first time I went there — they do have a ceramics section. It is just small, but not any smaller than the Curry’s near OCAD. So yesterday I was at 205 because I was to be at an SU meeting and then stayed in the building afterwards because I was trying to see if I could get other things done there or was needed there. Yes, a most atypical day since I usually don’t stay in that building. But since one of the things was to see if a prof happened to be there (and because I don’t want to stay on the 2nd floor and I knew I wouldn’t be able to stay on the 5th floor), I went to the 7th floor, and was surprised when someone called my name. Danica had told me she’s working for AV now; still, I was surprised to find her working on this side of AV. Actually, I never associated the 7th floor with AV, even I knew (in an intellectual sort of way) the AV desk is there. Why? Now that I think of it, people in my program (including profs) never borrow stuff from the 7th floor; we all automatically borrow from the 2nd floor, as if the 7th floor AV desk didn’t exist. No wonder I never knew there’s a common room on the 7th floor until I found my thesis advisor. I wonder: If someone I know had been working on the 7th floor AV desk way back when I was in first year, would anything have changed? So I thought I disabled Roots activation. I was wrong. Activation still caused trouble, and digging deeper I eventually found a way to completely disable it. Ironically, the correct way that I eventually found was my initial gut instinct that I had before I made the fateful mistake of deleting the file instead of doing this correct thing. And what is this “correct thing”? Just replace activation.php with a blank file. (That is, a file with a length of zero bytes if I’m not clear enough.) Yes really. Astonishingly, even with activation completely disabled WordPress is still acting strange. Apparently it gets wonky if you are using more than one menu. Since I need eight to pull off this project, I’m sort of doomed to failure. I’m going to resurrect activation.php to automatically reassign the menus. It’s ridiculous I have to do this but it looks like this is the only way out. Roots is pretty cool, but a major problem is the “activation” page. I’ve lost work more than once because I pressed the “Save” button by mistake, and my latest mistake involves having to ask someone to fix things up by FTP. It seriously provides no benefits at all and it has the potential and is very likely to do a whole lot of harm. So why is this dangerous page in there, and why is there no official way to completely take it out? I was at school working (never mind the building in the dream didn’t actually look like any building in OCAD) while there was going to be a ticketed event of some kind going on, then I went out of the building for a break of some kind. When I was going to get back in I found that the doors were already locked. It was like 6:50pm and it was also Thursday in the dream. (Or maybe Wednesday, I don’t remember any more.) (The event had not started yet. It was going to start at 7pm or so.) And it was extended hours also in the dream. So I was shocked. I was not exactly angry but definitely wanted to complain, so I sort of started walking around the building and trying to remember how to spell security’s Twitter handle; I also wanted to text a friend to open the doors for me but I wasn’t sure who was inside. (Obviously I still had a flip phone in the dream.) And while I was looking around I saw below me (remember, I mentioned the campus in the dream didn’t actually look like OCAD, I was on a terrace of some kind looking at some sort of wide stairs going down leading to an entrance below me. This doesn’t exist in OCAD. More like some sort of civic building or maybe some university in Hong Kong.) trying to walk towards the stairs leading to the building and the students below me found the entire edge of the building locked with a glass wall. As they turned around (presumably giving up and leaving) a back door to the building next to me opened. (As I mentioned this didn’t look like OCAD. It was a white building instead of a building with a glass wall.) I ran towards the door and got in, and yelled to the students at the entrance that Security had already locked the doors but they didn’t seem to get what I was saying from their blank looks (probably because they also didn’t expect this so they thought I was crazy). I ran up the stairs and saw another group of students working on some sort of a flattish piece of installation (never mind it was still inside the stairwell and that one of the students was Bing :) and I again yelled at them The doors has been locked. Everyone don’t get out. Then I continued running up the stairs trying to think about how to tweet a complaint or somehow write one. Then I reached the floor I wanted to reach and opened the door. (Yes, a single door. Weird. And never mind it was the wrong building. Maybe the OCAD in my dream finally built tunnels between its buildings.) It was a grand interior (remember, the campus I saw in the dream didn’t look like OCAD. It looked more like the lobby of a big convention centre or maybe UW’s new student centre.) with a ceiling that’s at least two storeys high with huge floor-to-floor glass walls looking at the pretty sky outside…. Then I woke up. I was dazed for a few seconds, then I looked at the clock. It was 9:05. Not early. But not exactly too late, I suppose.